Home / News / Celebrate Your Independence on the Peoples Coast! Celebrate Your Independence on the Peoples Coast! What are you doing for Independence Weekend 2011? Here is a list of celebrations happening all over the Oregon Coast. You can choose from small town, old fashioned celebrations to state of the art pyrotechnics or you can stake out a spot along the 363 miles of the Oregon’s Coastline and watch nature’s display. Whatever your pleasure you are invited to partake, join in and Celebrate Your Independence at the People’s Coast! The festivities kick off at 4:00 pm on Monday, July 4th starting with an all American hamburger and hot dog barbecue and live music by local musician, Rod Whaley. Bouncy houses will be available for kids and a festive selection of red, white and blue wine tastings will be available for adults.Local rock n’ roll band the Oyster Shooters, hit the Blue Heron stage at 6:30pm, to be followed by one of the largest fireworks displays on the Oregon Coast! Fireworks begin at dusk!$5.00 Per Person for the Barbecue. $3.00 Per Vehicle Parking Donation. Gleneden Beach 4th of July Celebration includes Pancake Breakfast from 8 – 11AM, Craft & Food Fair from 10AM – 3PM, and 17th Annual Parade at 1PM. Spend the 4th in Yachats! Start out with Lions Pancake Breakfast, 7:30 – 11:30am at Yachats Lions Hall, followed by the Whimsical, low-tech La de Da Parade at Noon sponsored by the Area Chamber of Commerce. After the parade , drop by the 7th Annual Fourth of July Pie & Ice Cream Social at Yachats Commons, from 11:00am – 3:00pm. Explore the town for an afternoon of great food, entertainment, outdoor crafts show, and live music. Find a place on the beach by the mouth of the Yachats River to watch the afternoon Duck Race. 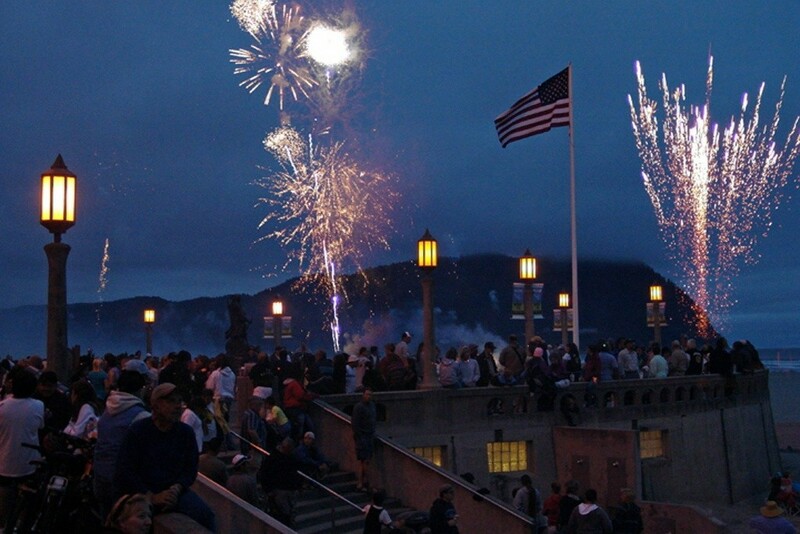 From the same beach or from almost anywhere downtown enjoy the Spectacular Fireworks at Sundown over the Yachats bay!